This is a remarkably self-assured debut by a poet who knows what she wishes to achieve and accomplishes her aims, both in terms of theme and form. 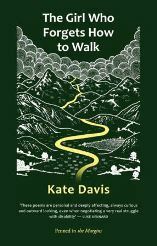 The title is taken from the book’s long central section, which follows the experiences of a young girl who contracts polio, a subject that Davis treats with a mixture of scientific knowledge, emotional poignancy and the beauty of art applied to unexpected subjects. By contrast, the opening section has poems that are frequently devoid of human presence, showing instead a deep geological knowledge of how landscape is formed, particularly the type of landscape that erodes or caves in, causing sinkholes that can swallow people, their homes and belongings. This movement from part one to part two is effective, taking the reader from a sense of instability in the ground under their feet, to the main sequence with its depiction of a physical condition that arrives suddenly and quite literally leaves a girl unable to walk. In the third section the ideas of the first two parts are brought together, with geology and anatomy combined in metaphors and imagery that have been sustained throughout the collection. This sequential approach, with many poems working well on their own as well as contributing to the developing narrative, permits the poet to experiment with form in order to approach the subject from different angles and in an impressive variety of styles. Davis’s poetry is described on the cover as ‘magic realism’, although it is also realistic and scientific. Poetry could often be described as magic realism, as readers are familiar with metaphors that merge and transform the subjects described, and there are certainly some poems where Davis uses a surreal approach. For example, in “Relativity” a street is being knocked down and the poet describes seeing ‘a woman / in clear space ten feet above the rubble / lift her hem to button a shoe’, while a man ‘asleep in mid-air turned over’. Are these imagined characters, the previous inhabitants of the houses, or has a wall fallen away and exposed them? The result is unsettling, rather like the seemingly surreal but factually accurate descriptions in the war poetry of Brian Turner, where ordinary roads are scattered with limbs and even a disembodied moustache after an explosion. she’ll drown you with your own hair. The cautionary tale approach combined with fairytale characters in this poem may be a kind of magic realism, but this will lead to scientific and realistic echoes in the central section, where a young girl goes swimming on holiday not knowing that ‘the sea hid a gob of virus’ and that ‘the virus intended to get to the core of her spine’ (“How the forgetting began”). The reality is as fearsome as Ginny Green Teeth. “Grim” is preceded by a found poem called “Tarn”, adapted from a textbook passage describing a village by a tarn and relating local superstitions about subsidence, flooding and an earthquake anecdotally caused by women taunting the priests. Facts and fears in “Tarn” chime with the fairytale tarn in “Grim”, while water links these with many other poems in the collection, including the sea that is at times beautiful but also contains the polio virus that will take away the girl’s ability to walk. Found poems provide factual information, such as the formation of limestone in “Limestone CaCO3)”, which is adapted from a scientific text. These found poems are presented in a narrow, newspaper column style format, and would not work on their own but are effective as ways of informing the other poems in the collection. There’s a music to the way the poems work together and strengthen each other, including recurrent imagery as well as subject matter and narrative. attachment positions for calliper system(s). Secure child in clamp and drill as marked. tightening opposite screws in turn. they shake their heads, they walk away. Davis is deft in the use of carefully selected descriptions that let the reader imagine these girls, who ‘clock her in their mirrors / whenever she comes in.’ This inability to move, able only to see via mirrors, captures their condition with pitiful precision for the reader, but turns them into mythological and fearful beings for the girl. This poem ends with the simple words ‘step step step step step’ and we are right there, willing the girl to succeed in her painstaking progress. The overall effect of the book is one of hope and the determination not only to survive but to thrive, although there is no Panglossian attempt to avoid the stark experiences of physical and emotional suffering, including bullying. Language is seen as having a saving ability, especially in the poem “Thesaurus for a Lady Gum-Shoe”, which uses a humorous private detective narrative and voice to show the search for words and behaviours than can help the vulnerable avoid ambush. Words like ‘Abnormal Aberration Ugly’ are replaced at the end of the poem by words including ‘Acceptable Consistent Equal’. Although this stops the old bullying words being ‘such tough guys’, the character now grown older is still watchful and must ‘keep a look-out’. The Girl Who Forgets How to Walk has clearly taken years to write, as has the ordering of the poems into a sequence that leads to them resonating together and strengthening each other. The time and effort have paid off and I look forward to reading more by this poet. London Grip Poetry Review – David Cooke	Jeff Koons, Ashmolean Museum. Review by Carla Scarano.